Kid #2 is a purist. She is completely unadventurous when it comes to food and it is a nightmare trying to get her to eat any greens besides broccoli, or anything with a smidgen of spice in it. But I have a stealth strategy that is to introduce tiny bits of spice or herbs into basic dishes to increase her taste vocabulary. Already we’ve made some progress because at least she will eat my spinach and eggs trio. It’s hard to imagine Chinese food without thinking of fried rice. I remember when living in the US, being somewhat horrified at the kind of Chinese food they had there. People were astounded when I pointed out that fortune cookies didn’t actually come from China and that they are actually pretty hard to find outside of the US. And I still don’t know why Americans like egg roll (which is a kind of Chinese chimichanga, huge, bolster-sized and filled with cabbage). It has zero resemblance to the small and crispy spring rolls that we see in dim sum. And can someone tell me what Singapore noodles are? We sure don’t have them in Singapore! Anyway we somehow managed to survive on lots of home cooking as well as a few select South East Asian restaurants. Thank goodness I was posted to New York and not Illinois or Milwaukee. Fried rice is a real simple staple for Chinese and a great way to use up leftover rice from the previous meal. 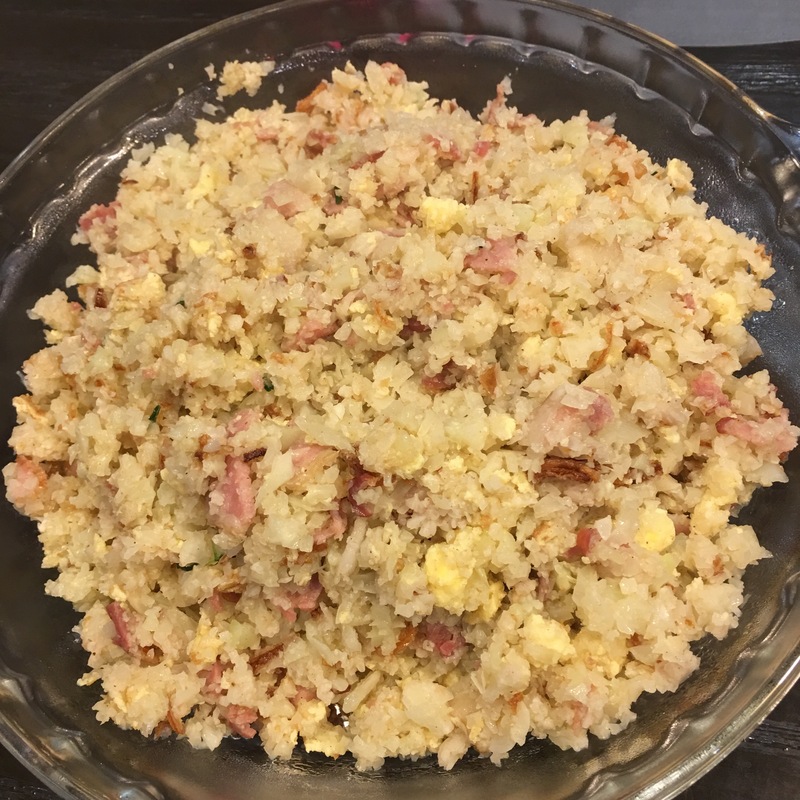 Making low carb rice is not so mind-boggling as you can imagine because cauliflower that you chopped up in a processor does have a kind of rice-grain appearance. I think the trick is to not over-fry the cauliflower as longer frying makes the cauliflower rice more soggy. So for this fried rice I also avoided liquid seasoning like soy sauce that can make the rice appear more wet. And the best way of masking the inevitable cauliflower flavor is to amp up the spices for the dish. So lots of garlic, some odd spices work. If I were not cooking for my veg-averse kid#2 I would also add in spring onions into this rather plain-looking rice. Heat up the oil in a skillet and fry the bacon pieces till they render the fat. Add in and fry the garlic till lightly browned and fragrant. Add the cauliflower dice and fry. Add the seasoning, such as the salt, pepper, paprika and garam marsala. Fry the cauliflower rice for about 3-4 minutes until slightly tender. Push the ingredients to one side of the pan and add the beaten egg to the freshly cleared space. When slightly cooked through, scramble the egg and stir it through the rest of the rice. If desired, add the shallots and stir through the rice. Serve hot with some chopped chives/spring onions on top.